Near Grande Falaise, the Cabot Trail winds through green hillsides around the northern end of Cape Breton Island in Nova Scotia. The road near Grande Falaise along the Cabot Trail is very peaceful as the sun shines over the landscape with no other cars anywhere in sight. 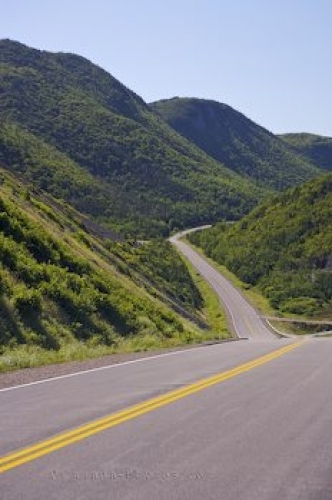 The Cabot Trail travels for one hundred and eighty-five miles around the north tip of Cape Breton Island and passes through Cape Breton Highlands National Park in Nova Scotia, Canada. Picture of the road along the Cabot Trail near Grande Falaise in Cape Breton, Nova Scotia.